On this date in 1537 the first complete English-language Bible based upon Greek and Hebrew sources, the Matthew Bible, was published, with translations by William Tyndale and Miles Coverdale. Already in the Middle Ages, the question had arisen of translating the Bible into the vernacular (or modern) languages. It was resisted by authorities of the Church establishment, partly because the issue very soon got involved with reform movements within the Church. One of these reform movements was led in England by John Wyclif, a contemporary of Chaucer in the fourteenth century. His disciples, working mainly after his death, produced an English translation of the entire Bible, which was of course a translation of the Vulgate Latin text, not of the Greek and Hebrew. 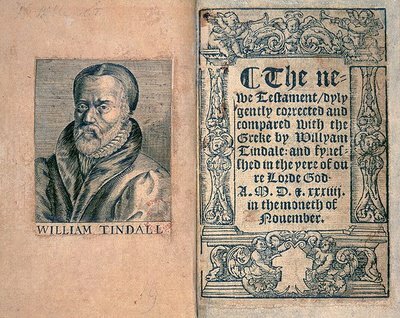 Nevertheless, the Wycliffe Bible became the basis for all future English translations. In the sixteenth century, the Protestant Reformation broke out in Germany under Luther, and one of Luther’s major efforts to consolidate his position was to make a complete German translation of the Bible, which became among other things the cornerstone of modern German literature. This entry was posted in Anniversaries, Bible on October 4, 2010 by Michael Happy. This entry was posted in This Week in Climate Change on October 4, 2010 by Michael Happy. Joplin singing “Cry Baby” at Varsity Stadium, University of Toronto, June 1970, barely three months before her death. A beautiful, heartbreaking performance: heartbreaking because you can see her unravelling around the edges and hear that mighty voice threatening to break here and there, and she’s only 26 years old. The sound is excellent, and the cameraman gets it right — he stays focused on that remarkably expressive face for most of the performance. Today is the fortieth anniversary of Janis Joplin‘s death (born 1943). This entry was posted in Anniversaries, Popular Culture, Video on October 4, 2010 by Michael Happy.